We are in the middle of a hot summer – and I am fully enjoying it! If you know me, you know that I struggle with anything below freezing, so I try and soak up the heat to get me through the cold winter. Our summer is also full of fun activities with the kids. During the school year, our activities revolve around the school schedules and their school work, but our major focus with the kids is not education but their personal formation. So, during the summer we are able to do more Bible studies and book studies, worship, therapeutic play, mentoring and discussions about skills they need for life. It’s a packed schedule, but it’s a lot of fun. We also have more time to play together: Settlers and Ticket-to-Ride, volleyball, and swimming. We were blessed to have some new friends, Nicholas and Autumn Morgenstern, do art and dance activities with the kids. 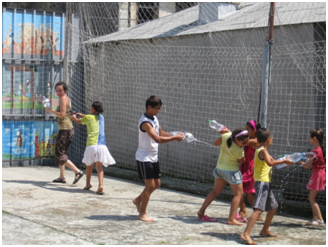 At the beginning of the summer, we received two first-grade girls into the Community Center. It is always a delight to see their excitement and the way that they experience things for the first time. We had wanted to receive another little first-grader as well, but the girl’s father decided to take her on a trip to France. For most kids that would be an exciting summer vacation, but for this little girl it most likely meant begging. Little beautiful girls are put on the street corners to ask strangers for money. And it can be quite lucrative. We are praying that this girl returns to Galati in time to start school. And we are hoping to receive her into our Community Center, where we can work to prevent child trafficking and forced begging. 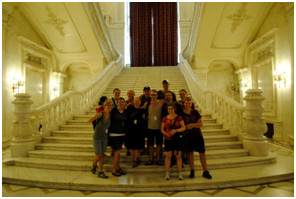 In June, we had a team of 12 come from George Fox University. We spent a week in Moldova and two weeks in Romania. The team did a lot to help us clean the Center, move furniture, cut down trees, rebuild fences. Member of the team also shared their testimonies with our youth, which was impactful. Of course, the team also did lots of fun activities with the kids. We really were encouraged and supported by them during our weeks together. At the end of the summer, we are organizing our 12th annual camp. It will be a week when we can get out of the city and spend a full seven days together. Besides the archery, hiking and horseback riding, the kids will have 3 full meals a day and their own beds to sleep in. It costs us about $200 per child for the week. If you are interested in contributing to camp, please let me know. The last weekend of June, Lenutsa and I went to England – unfortunately, it wasn’t for the Olympics. 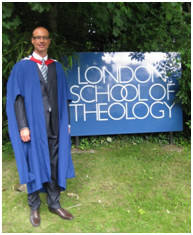 Last October I finished up a MA course that I did through London School of Theology, and the graduation ceremony was held in June. It was a nice way to celebrate the achievement and to meet some of the other students and faculty. After the graduation, we visited some of our friends in Wolverhampton, where we spoke in some churches and small groups, and played in a golf fundraiser. As I hit a wapping 9 on the last hole (par 3), I was glad I could make everyone else feel better about their game. All in all, it was a jolly time. We are now in the U.S., in Omaha for most of August. We had the privilege of meeting with friends at Winterset Community Church in Iowa. 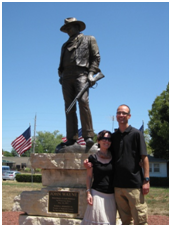 It was our first time there, and we were blessed by their welcome and worship. We will participate in the missions conference at Lifegate Church in Omaha. And we also hope to be with our friends at Emmanuel Fellowship before we depart. It is overwhelming and encouraging to be able to connect with those that have been praying for us and supporting us over the years and also to build new relationships that we pray will develop over the coming years. As our ministry among the poor in Romania and our broader region of Africa and Europe continues to grow, we are looking for others to partner with us. Since I have been living and serving in Romania for more than 15 years, building new relationships with potential supporters has been a challenge. But this is essential if we are to continue to flourish. Please pray about partnering with us or in building partnerships for us.